You've undoubtedly seen Windows 7 notification balloons displayed in taskbar area. By default a notification message appears for 5 seconds and then slowly fades away. Unfortunately it requires more than 5 seconds for me to fetch a cup of coffee and return to my PC. I may well have missed a notification message while I was gone. If you have the same concern, you'll be happy to know that you can easily increase the notification display time. In Control Panel select the Ease of Access group. In the Ease of Access group, click on the "Ease of Access Center" link. At the bottom of the Ease of Access Center settings page click on the "Make it easier to focus on tasks" link. 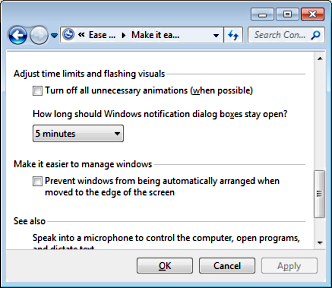 At the bottom of the Make it easier to focus on tasks page, in the Adjust time limits and flashing visuals section, in the "How long should Windows notification dialog boxes stay open" drop-down list, select a time interval up to 5 minutes. Click on the [OK] button. Windows 7 notifications will now be displayed for the amount of time you have chosen. It's safe to go grab that cup of coffee.